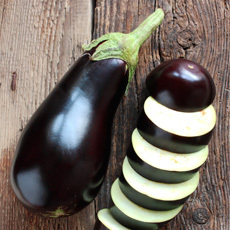 A Mediterranean Diet staple, eggplant is loaded with vitamins and minerals. Naturally low in calories, this hearty, satisfying vegetable is a source of fiber and potassium. Since eggplant is extremely versatile and can be cooked in many ways, it’s easy to add this nutritious powerhouse to your diet. Here are a dozen ways to bring it to your table. Broil a whole eggplant for about 15 minutes, turning with tongs every 5 minutes. Cut in half lengthwise, scrape the flesh into a bowl, and mash with lemon juice, olive oil, feta, onion, bell pepper, chili pepper, basil, parsley and a touch of salt for a tasty spread. Brush sliced eggplant on both sides with olive oil. Grill until tender, turning once. Spread each slice with 1 teaspoon of pesto and top with a sliced tomato, mozzarella, and basil. Drizzle with olive oil and balsamic vinegar. Bake a whole-wheat pizza crust at 450°F until the bottom is crisp (approximately 3 minutes). Turn the crust over. Add marinara sauce, chopped basil, garlic, thinly shaved Parmesan cheese, and eggplant cubes. Bake 12 to 15 minutes more. Sauté or bake eggplant with zucchini, peppers, and onions. Combine with couscous or quinoa, add olives and chickpeas, and splash with lemon juice and olive oil. Peel eggplant and cut into ½-inch cubes. Sauté in olive oil until brown on all sides. Add garlic, crushed or diced tomatoes, and basil, and serve over whole- wheat pasta. Slice eggplant lengthwise into ¼-inch-thick pieces. Bake at 400° for 15 minutes. Then top each slice with tomato sauce, grated Parmesan, and chopped basil. Roll up, securing with toothpicks. Chop an unpeeled eggplant, toss with olive oil, sprinkle with salt, and roast at 400°F for 10 to 15 minutes along with a box of halved cherry tomatoes. Combine the two to enjoy with fish or chicken. Grill sliced eggplant in a nonstick skillet. Spread about 1 tablespoon of goat cheese on both halves of a multi-grain or whole-wheat sandwich roll or English muffin. Bake at 275°F for 8 to 10 minutes. Remove from the oven and top the bottom half with eggplant, tomato, and arugula. Bake a whole eggplant on a baking sheet at 350°F until tender, about 45 minutes. Scoop the flesh into a food processor with parsley, Greek yogurt, tahini, lemon juice, chopped garlic, and cumin. Serve with bread or veggies. Brush eggplant slices with olive oil, grill for about 5 minutes on each side, and top with a slice of mozzarella. Peel and slice eggplant about ¼-inch thick. Brush with olive oil and grill on both sides for about 5 minutes. Arrange on a baking sheet, top with diced tomatoes, olives, and crumbled feta, and bake at 400°F for 10 minutes. Cut eggplant in half lengthwise, slice, and steam for 10 minutes. Sauté minced garlic and chopped scallions in olive oil. Add the eggplant, lemon juice, and fresh chopped parsley and toss.